The first moment I tried on dresses was the day after we got engaged! Woo! No wasting time over here. It was a last minute decision that was made the morning after our engagement. The reason why: My mom was was in town. And it was very important to me to have my mom be a part of this Bridal Gown experience with me for several reasons, so I wanted to take advantage of her being with me to get started on the task. Especially because Taylor and I had already talked about a short engagement, I knew this was something I needed to start thinking about. 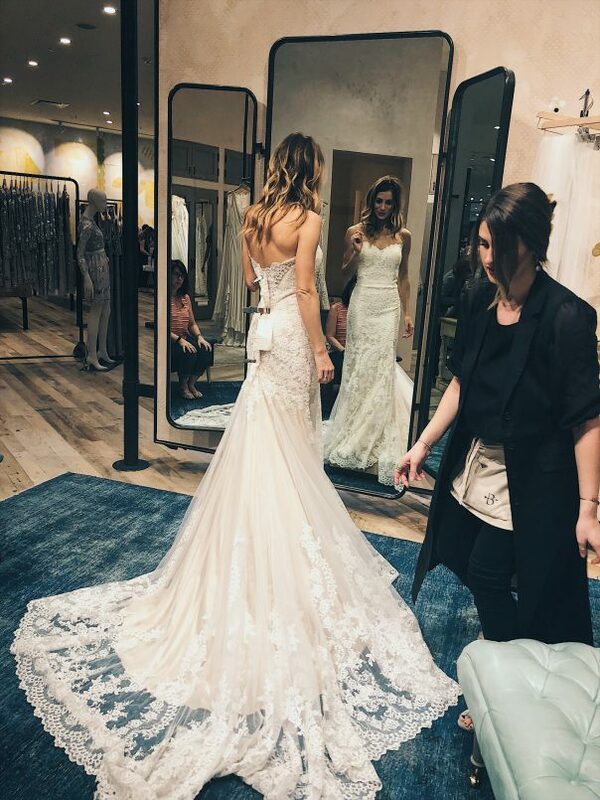 (They say to give yourself a few months for the dress to be ordered and altered  - we were barely even giving ourselves months to the wedding!) I obviously had no idea that I was getting engaged or that my parents would be in town to surprise me (read our engagement story HERE), so that Saturday morning after the proposal I called around to a few different Bridal Shops to see if they had any last minute openings. BHLDN at Fashion Island had one opening an hour and a half from the moment I made that phone call, so my mom and one of my best friends hopped on the freeway and took an hour drive north to play some dress up in wedding dresses. 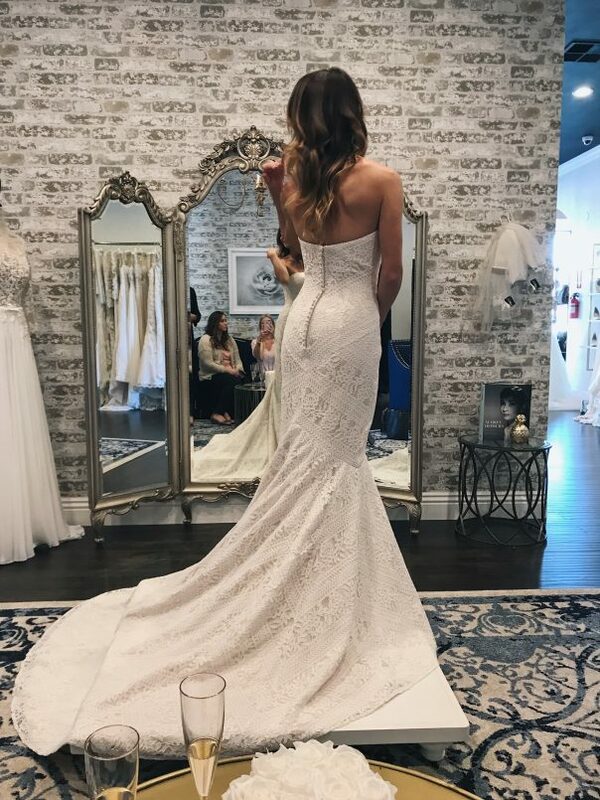 A little note about BHLDN- although this is not where I got my dress, I had been told that you could get your dress with a pretty quick turn around (within two weeks), and this had been appealing to me, so it worked out that it was the first place I tried! We had a great experience that day and ended up getting my shoes, jewelry, my mom's dress, and our Flower Girl's dress from BHLDN. This first little shopping trip was just what I needed. It was unplanned, I didn't have a huge entourage to throw in their opinions, and I had my mom in person with me for these very fresh engaged/wedding planning moments as I knew that the majority of our wedding communication would be done over the phone (she lives in Oregon where I'm from). With these first few dresses, I tried on a couple different silhouettes and textiles. It really helped me narrow down what I knew I loved on me. I didn't leave with a dress that day, I was super excited, but I wasn't completely sold on any of them being "the one". I think it was nice for me to know that there were a few that I did love just in case I ended up needing to purchase a wedding gown with only a two week window! After all the dresses I tried on, I was able to determine more of the style that I was looking for. That day I established these desires: a fitted mermaid style dress, with lace, and a sweetheart (or close to it) neckline. I also liked the idea of a bit of a train- nothing too extravagant. 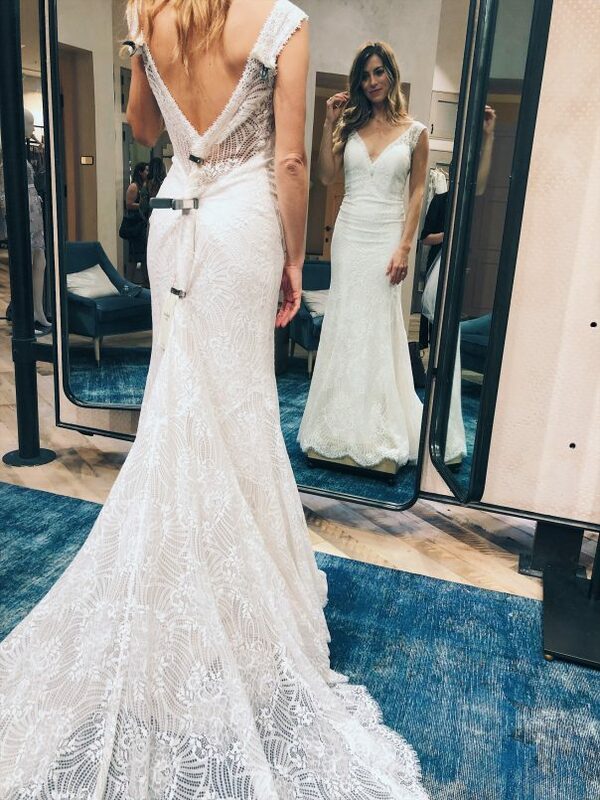 They say you'll know when you've found the dress. I guess like knowing when you've found your guy! To be honest, I wasn't sure that I would "know" because I'm not always super opinionated, which can lead to indecisiveness, and I'm definitely the kind of girl that could confuse myself by trying on over hundreds with the concern of "could there still be something better?" 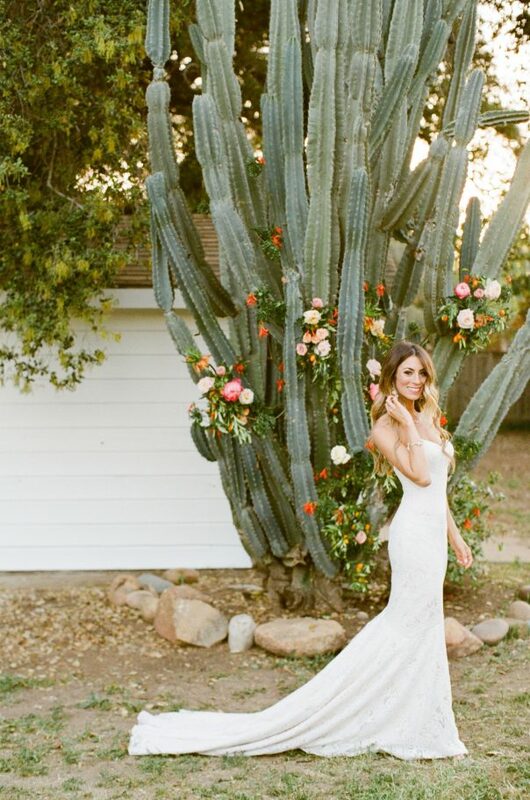 But I guess everything with our wedding, including my dress was just all meant to be, because I knew the moment I laid eyes on my dress that it was "The One"! Remember how I mentioned that it was really important to me that my mom would be a part of my Bridal Gown experience? Well, by default my mom is the one that found my dress. Which makes the whole story even that more special. About 3 weeks after the engagement (a lot had taken place by them: a Wedding date, venue, etc. 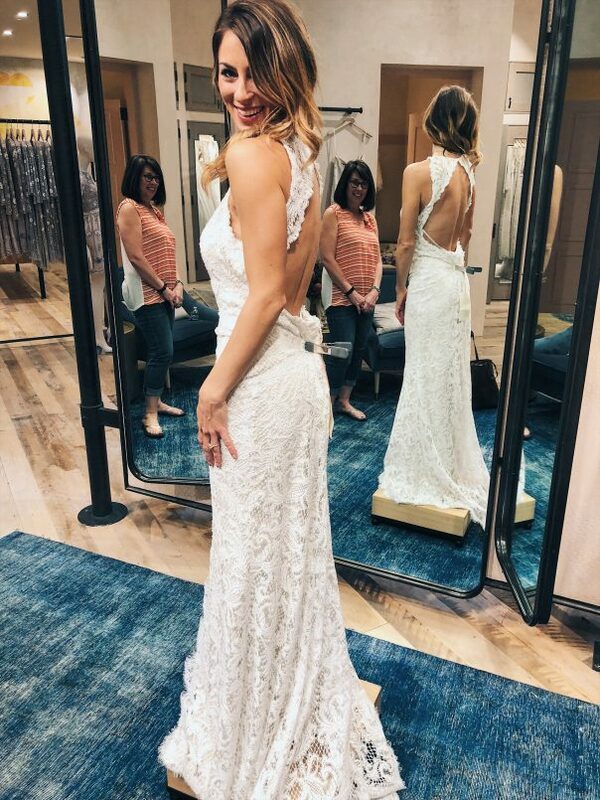 but still no dress), my mom sent me a photo of a dress she had found while she had just "happened" to be at a Bridal Shop in Portland (back at home). She said that everything about it looked like what I had been describing as the dress I was looking for. She also said that it was within my budget! So I decided to look to see if by chance this particular Lillian West dress was anywhere near me where i could try it on. It was! 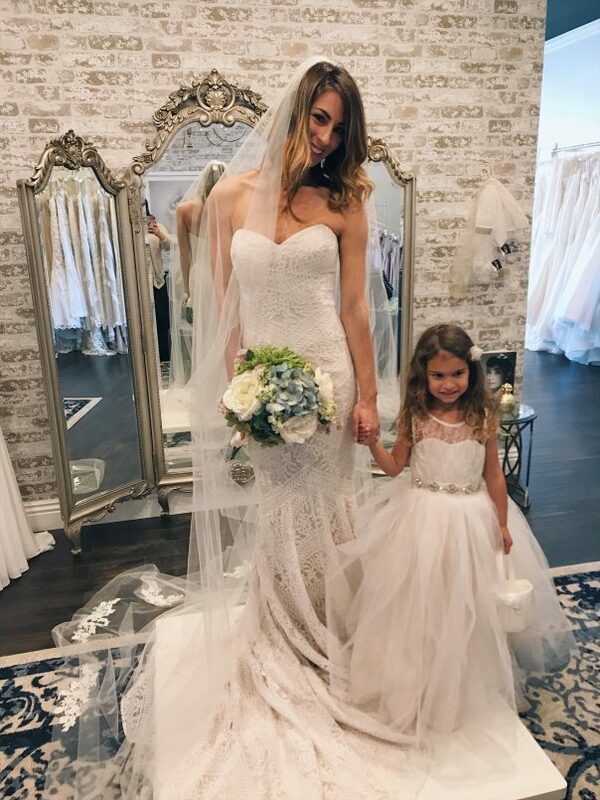 I found it at this sweet Bridal Boutique called, "Something Bleu" just a few beach cities north of me in downtown Oceanside. I again decided on a whim to go try this dress on. I brought my best girlfriend in tow. We only had about an hour to do this little try on session as I was booked solid with Nutrition Clients that day. So we walked into Something Bleu with a mission. I tried the dress my mom had sent me a picture of, and that dress only that day. I put it on, and cried as I walked out of the dressing room. I stepped in front of the mirror and KNEW, this is the dress that makes me feel like me, the dress that I cannot wait to be wearing when I say "I do" to Taylor. My girlfriend was in tears too — she's a good sport and cries along with me. I face-timed my mom and told her that she had found me my dress. I'll forever remember getting to share that with my mom. 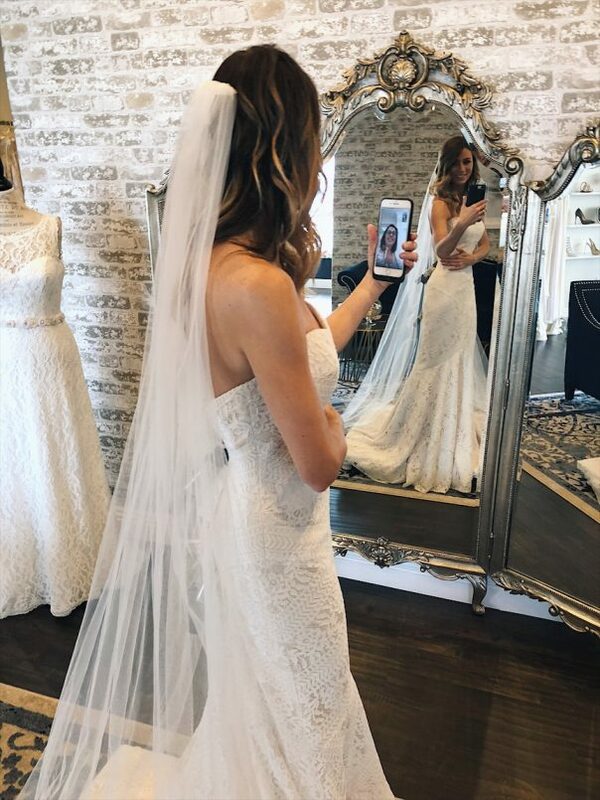 I face-timed my mother-in-law too, even though she lived near because I figured that the moment you find your dress, should be shared! I knew that I had found my dress! And my mom was right, it fit every bit of the description I had said I was looking for! I was also very lucky that this gown designer (Lillian West) often keeps a couple dresses in stock, so it was not hard for Something Bleu to order for me and get to me quickly. And it was also in my budget! It was perfect. BUT because it's kind of like a rite of passage finding your wedding dress, I wanted to wait to put the order in until I could do something a bit more official with my Bridesmaids with me. 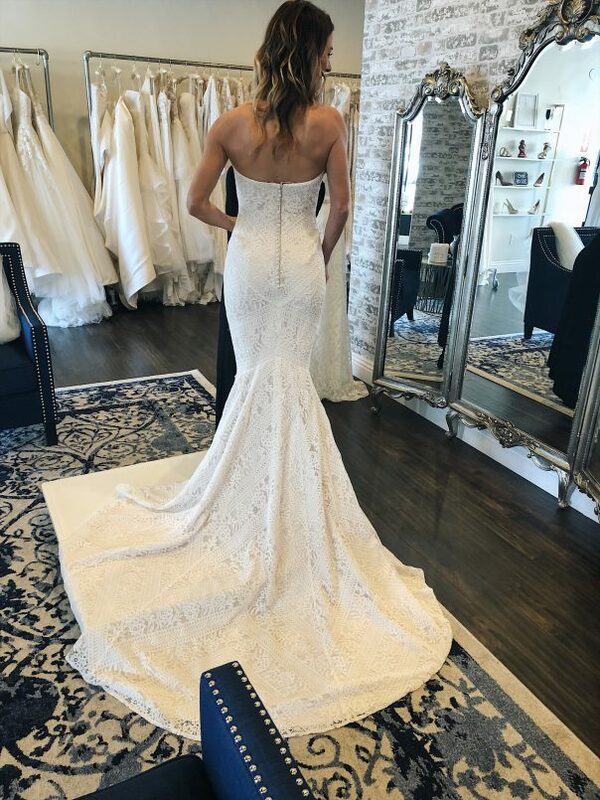 Since I hadn't done a traditional long day of dress shopping, I wanted to invite my girlfriends to come to the shop with me, so i could try it on for them, we could pop some bubbly, and it could be a done deal by saying "yes to the dress!" 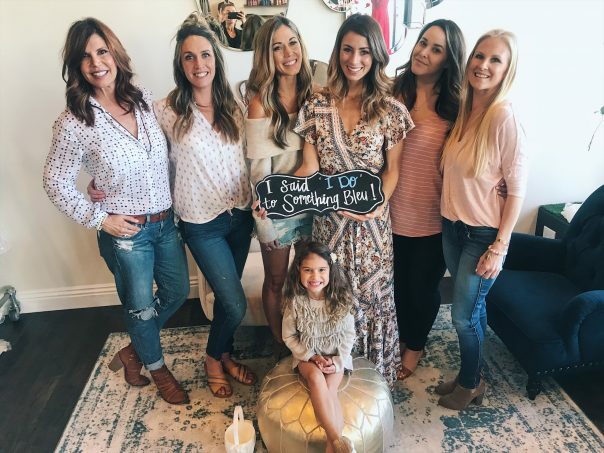 Most of my local bridesmaids, my mother-in-law, and one of our flower girls joined last minute for the occasion that took place only a few days after I had found the dress. (We moved quickly planning this wedding on all levels!) We even had sweet Henley try on a dress with me! On our wedding day as I slipped into my dress with the help of my mom and my sister, I felt like every bride should. I felt confident, beautiful, and like my very best self. I was ready for my Handsome groom to see me. A blog on our FIRST LOOK is to come! Moments before seeing Taylor for the first time on our wedding day. Know your style! If it's an option, try a few different styles on without too many other opinions around. 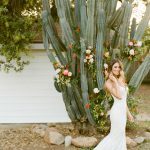 Choose a day that's not super formal and without pressure to purchase, just to give yourself that time to really find YOU in your wedding dress style. Then plan a day to officially go shopping and share with your wedding dress consultant what you've found that you like on you. BE YOU! This was advice I've collected over the years as I've watched multiple friends walk down the aisle and way too many TLC's Say Yes To The Dress episodes. 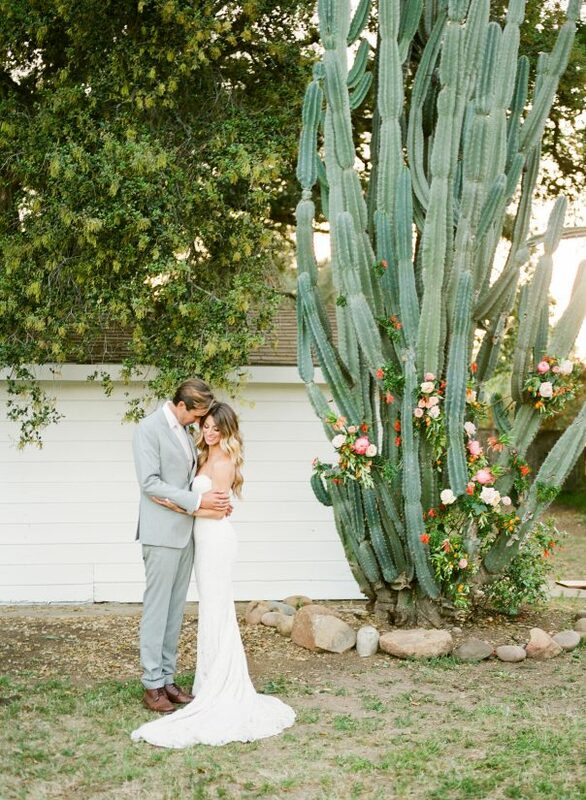 Your wedding day isn't a day to be anything but you. So remember that when opinions are flying around when trying on dresses. Make sure YOU love it because YOU love it! Also, if the dress you choose is your style, it's bound to fit any setting or tone of wedding you choose to have! Not too many! Obviously, go for it! But like I mentioned, I'm someone that if I have too many options, it becomes a lot harder for me to make a decision. This is why I recommend narrowing down your style! Budget! This one was important to me. Even though I wanted to feel my best and find my dream dress, I wasn't going to look outside of what I could afford. I'm an extremely practical person- sometimes to a fault. But once you start trying on the dresses over your budget, of course you'll start getting confused! And with my practical mindset, I knew that I would be wearing this dress for one (very special) day. I could feel beautiful and Love something in my budget! LOVE IT! You really should love your dress. It's okay if you don't cry! Not everyone cries, and I think this is an expectation some brides put on themselves when dress shopping. But most importantly you should love the way YOU feel in your dress. You should be excited to wear it. It's going on a year later, and I'm really tempted to host a party for all of my girlfriends to get dressed up in their wedding dresses, just so I can put mine on! I LOVE reminiscing, thank you for letting me share! 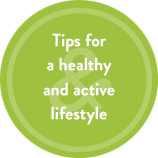 Are there any tips or etiquette notes you would add to this list? Please share! Any questions that you have? P.S. If you're looking for some tips to get physically ready for your bridal moment, read my blog "Shredding for the Wedding" HERE. A workout included!